A typical question I am often asked as a Nobel Laureate in physics is “what brought you to physics?” I am not sure but I do know that in school in geography when looking at the presentations of the planets orbiting around the sun I asked myself: “What is the reason for this strange behavior?” It was a real revelation when my physics teacher Mr. Röderer explained to me that this is caused by the balance of the attraction between masses and centrifugal forces. This roused my enthusiasm and whetted my appetite. Still, during my last few years in high school, I spent more time with sports, boy scouting, alpinism, music etc. so my performance in school was reasonable but not more. Perhaps in this context, it might be of interest to know that my father held a diploma in mechanical engineering from the Technical University of Bruenn (Cechia), and worked for the Skoda factory in Pilsen designing locomotives. He died during the last days of the war, so after our expatriation to the western part of Germany, my mother was left alone to take care of her two children, namely my two-year older sister and myself. At the age of 19, I started to study physics at the University of Frankfurt and changed to the Technical University of Darmstadt three years later. I finished my diploma thesis there at the age of 26 and my PhD thesis at the age of 29. In both theses, I applied optical spectroscopy to determine crystal field split energy levels of rare earth ions in garnets. The director of the institute was Professor K. H. Hellwege. As I did a lot of computational work for the experiments, he used to say to me when he met me in the corridors: “Above all mathematics, don’t neglect the physical background” which he called “Physikalischer Hosenboden” (lit. “physical bottom”). This must have made a lasting impression on me because I have a strong desire to explain new phenomena which I come across in simple physical pictures and do not feel comfortable with mathematical formalism alone. Today, I would like to pass this attitude on. In computer simulations in particular we would get lost in an abundance of results if we did not maintain a critical view for the source of the effects. This is especially true for phenomena caused by a constructive or destructive interaction of various mechanisms. My direct supervisor for my thesis work was Prof. Stefan Hüfner. The topics of garnets and crystal fields also brought me to the laboratory of Prof. A. Koningstein in Ottawa, Canada, where I worked as a postdoc for a little less than three years. As was the case until then my goal remained the determination of crystal fields, but here I used the electronic Raman effect to determine the energy levels experimentally. Since Raman scattering is mainly caused by the optical phonons, these were also included in my investigations. A photo of me at the age of 33 is shown in Figure 1. Figure 1. Peter A. Grünberg (PAG) at the age of 33 when he started his work at the research centre in Jülich. In 1972, I was offered a position as a research scientist at the newly founded Institute for Magnetism at the research centre in Jülich. The director was Prof. Werner Zinn. His picture (marked with WZ) is included in the group photo of Figure 2. He was mainly interested in investigating the model magnetic semiconductors EuO and EuS. I also started to work on these compounds, applying optical absorption spectroscopy as well as Raman scattering (RS) from phonons. The RS experiments were performed at the Max Planck Institute for Solid State Physics in Stuttgart in the group headed by M. Cardona. My partner in Stuttgart was Gernot Güntherodt (marked GG in Figure 2) with whom I explored the magnon phonon interaction in EuO and EuS. Figure 2. 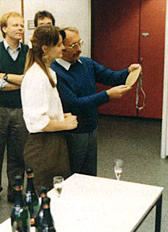 Group photo from the conference on thin magnetic films and surfaces in Le Creusot (France in 1988) when GMR was publically announced for the first time. This photo appears here because it shows many colleagues who are mentioned in the text that follows. RS often causes a problem if we want to observe scattering with small frequency shifts below about 30 GHz (corresponding to 1 cm-1). This is the domain of Brillouin lightscattering spectroscopy (BLS), where instead of a grating monochromator as in RS, a Fabry Perot interferometer is used as the dispersive element. In the early 1970s in BLS instrumentation, an interesting development occurred due to the pioneering work of John Sandercock in Zürich. He invented the multipass operation, and later on, showed how two multipass interferometers could be used in tandem. Following this example we assembled our own setup, namely a triple-pass spectrometer without tandem operation. A schematic is shown in Figure 1 of . John not only pioneered the experimental technique, he also demonstrated the improvement with the first BLS measurements of various phenomena in solid state physics. This work had a great impact on ours. At the same time, he established his own company. Researcher, inventor, entrepreneur, salesman – all at the same time: following in the footsteps of Alfred Nobel! I have the greatest respect for such people. He has since been awarded various prices, of which the David Richardson Medal of the Optical Society of America (2005) is the latest. One of his experiments grabbed our attention in particular. It was the first measurement of acoustic spinwaves in Yttrium Iron Garnet (YIG) and there fore the first time that acoustic spinwaves were measured in ferro- or ferrimagnets by means of LS. This result encouraged us to try the same experiment with EuO. However, as this compound only orders ferromagnetically below 60 K, cooling was necessary. Fortunately, a cryostat with a superconducting magnet was available from the optical experiments, so it was brought to the BLS setup. Before long, we were able to detect BLS from the bulk spinwaves. Additional scattering with a very strong Stokes/anti-Stokes (S/aS) anomaly could finally be identified. This was due to a spinwave propagating along the surface in one direction only and not the opposite. The successful observation of spinwaves in the bulk and at the surface of EuO is described in . It has the character of an anecdote that the clue for the interpretation of a certain peak, caused by a surface spinwave, was uncovered when the experimental setup broke down and had to be repaired. Further important results in this context were obtained by John Sandercock together with Wolfram Wettling. They measured the bulk and surface spinwaves from ferromagnetic metals in the shape of platelets with thicknesses of the order of mm. Standing spinwaves in thin films with thick nesses of the order of 100 nm or less were seen by Marcus Grimsditch and Alex Malozemoff (AM in Figure 2) for the first time. References to all of this work can be found in reference 2 of . From this period, I also would like to mention fruitful contacts with Burkhard Hillebrands (BHi in Figure 2), who later extended BLS to thin film structures with lateral confinement. Often in experiments with light, strong metallic optical absorption is considered a disadvantage because it significantly reduces the interaction volume. In LS experiments on standing spinwaves, however, it turns out to be of advantage because the wavevector of the incident light is smeared out due to strong optical absorption. As a result, a whole band of wavevectors is available to fulfill total momentum conservation, which is one of the required experimental conditions in BLS. A BLS spectrum from spinwaves showing the surface – and a standing mode is displayed in Figure 2 of . To emphasise the last point: the standing modes are only observed because the wavevector of the incident light is sufficiently smeared out due to strong metallic optical absorption. In contrast, unpinned standing modes with antinodes at the surfaces are not seen by microwave absorption because the total precessing moment cancels out. This aspect was later discussed by John Cochran and Bret Heinrich. Both are seen in Figure 2 on the upper right-hand side, marked JC and BH, respectively. Next, we extended the LS investigations of spinwaves to multilayered structures. We concentrated on “magnetic double layers” i.e. two ferromagnetic films separated by a non ferromagnetic interlayer. One main interest was the coupling of DE modes to the collective dipolar modes of the structure. The most important results of these investigations are summarized in Figure 3 of . At this point, I wish to mention that my meanwhile permanent staff position in a government-funded research laboratory allowed me to make long-term planning and to build up equipment for sophisticated sample preparation. At that time, such components were only partly available on the market. In this endeavour, I was assisted by my technician Reinert Schreiber who designed, assembled and operated the machine to prepare the samples. A particular feature which he installed was the “wedge technique”. It provides the possibility of making thin-film samples with increasing thickness from one end to the other. Later, this turned out to be very helpful for the study of thickness dependencies. 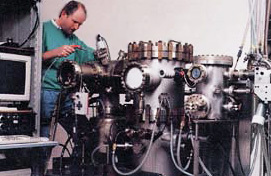 A picture of Reinert performing some leak testing is shown in Figure 3. I did the first calculations on the dipolar-coupled DE modes, as displayed in Figure 3 of  myself. The extension to multilayers was done together with my colleague K. Mika from the mathematical department of our institute. Knowledge of the effect of dipolar coupling on the spinwave frequencies and the experimental result on standing modes was sufficient to be able to qualitatively predict their behaviour under the effect of ferro- or antiferromagnetic exchange coupling. This is explained in  in the context of Figure 3 and Figure 4. Figure 3. My technician for many years, Reinert Schreiber, while occupied with leak testing. Let us return to the “trilayer” or “magnetic double layer” structure as displayed in Figure 3 of . It explains how F and AF coupling can be determined qualitatively from the frequency shift of the optic mode. What we observed at that time were only frequency upshifts. According to Figure 4 of , the coupling then is ferromagnetic. In the early 1980s, it was believed that there were mainly two mechanisms that explained coupling. These were pinhole coupling via magnetic bridges across holes in the interlayers and “orange peel” or Néel-type coupling due to meandering interlayers. Remagnetization curves which can reveal antiferromagnetic-type coupling yield no information when the coupling is ferromagnetic. For these reasons, the situation concerning coupling was still rather uncertain in the early ’80s. Under these conditions, we started a systematic search using the spinwave method. We also concentrated on the more unique case of antiferromagnetic (AF) type coupling, trying to find an example. While on a year’s sabbatical leave at Argonne National Laboratory in the U.S. as a guest of Mervin Brodsky, this search was finally successful. We detected AF coupling in Fe/Cr/Fe structures on cleaved substrates of rocksalt. Details are found in . Two of the colleagues I met at Argonne, with whom I worked on other topics namely Ivan Schuller (IS) and Sam Bader (SB), can also be seen in Figure 2. When I came back from the U.S., I continued working on the reproducibility of the effect, now using also epipolished GaAs substrates. At that time, Jozef Barnas, a theoretician from Poznan in Poland, joined my group and we started to work on a quantitative theory of the effect of coupling on spinwaves. A photo of Jozef is shown in Figure 4, and some results of our joint efforts have been published in ref. 2 of . Figure 4. Jozef Barnas from Poznan in Poland worked in Jülich on the theory of spinwaves as modified by coupling, and on the theory of GMR. Furthermore, at that time, anisotropic magnetoresistance (AMR) was widely discussed by the community for applications in sensors for hard disk drives. So “something was already in the air” regarding MR effects and we decided to complement the available experimental techniques with magnetoresistance. Jean Pierre Renard (JR in Figure 2) had found an effect which later on turned out to be related to GMR. In our laboratory, Gaby Binasch installed the equipment during her diploma work and did the first measurements on permalloy films. Since Reinert Schreiber was now also able to make AF coupled Fe/Cr/Fe structures in a form suitable for measuring of electrical resistivity, GMR was seen before long as discussed in  and published in ref. 8 thereof. Gaby finished her thesis and received her diploma in physics (equivalent to masters). After this, she left Jülich for an interesting job in industry. She can be seen in Figure 5 at the celebration for her diploma. Figure 5. Gaby Binasch celebrating her diploma and receiving a handmade medal. Here she is just listening to Peter Grünberg who is reading the dedication to her. Before I come back to GMR, let me add a few more details on coupling. As mentioned in , at the same time that we were working on Fe/Cr/Fe, other groups found similar phenomena for rare earth layers (Gd, Y) separated by Y layers. An RKKY-type mechanism was proposed by Yako Yafet (marked YY in Figure 2) as an explanation. Even oscillatory behaviour as a function of the interlayer (Y) thickness had already been reported. However, it seems that only after the discovery of GMR, coupling per se also received general attention. And sure there were many results and surprises. The RKKY-type mechanism was applied to structures with magnetic 3d-transition metals by George Mathon (GM in Figure 2), David Edwards and Patrick Bruno (PB in Figure 2). With the permission of the colleagues involved, I may at this point tell the following anecdote. In the course of his search for AF couplings Stuart Parkin from IBM San Jose (SP in Figure 2) had found it also for sputtered Co films with  texture interspaced by Cu. The Dutch group from Philips Eindhoven established oscillatory coupling for this system also for epitaxial growth with  orientation. 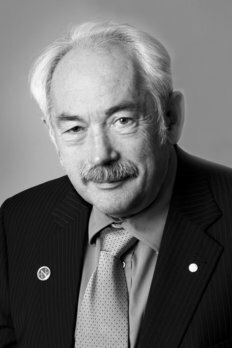 Bill Egelhoff from NIST in Gaithersburg, well-known for very fine work in epitaxy, however, reproached vigorously. I still remember a MRS meeting in San Francisco where he defended his point. Then Professor Gradmann (UG in Figure 2) from Clausthal University in Germany stood up and said: “Bill I think I know what happened. Your samples are too good. You have very fine surfaces which nucleate antiphase domains that give large angle grain boundaries between the islands. Then you can get diffusion of Co along the boundaries and the formation of magnetic bridges. The resulting F-coupling swamps any possible AF coupling.” Bill Egelhoff responded simply: “I like that”. Indeed, somewhat later, Jürgen Kirschner (JK in Figure 2) and his group from Freie Universität in Berlin added further evidence to this case by showing that grain boundary formation comes from the usual competition between ABABA.. and ABCABC… type stacking for hcp type structures along . Coming back to Bill Egelhoff, it has also to be mentioned that he used oxygen as a surfactant to set the record values for GMR of 25% in the simple trilayer structures of Co and Cu and also dual spinvalves with two Cu interlayers. In multilayered structures, of course, the effect is much stronger. This example demonstrates again that coupling can change drastically with growth, which makes comparison with theory ambiguous. Then how do we know that current theories on this phenomenon as proposed for the first time by Yako Yafet are in essence correct? An important contribution to this comes from Bob Celotta’s group at NIST. They grew trilayer-type samples, where one magnetic layer was replaced by a single crystal Fe whisker, which at the same time is used as a substrate. For the interlayer, various materials were chosen with an emphasis on good matching to Fe. Coupling is seen via magnetic domains, which are made visible using SEMPA. These indeed superb and celebrated experiments left no doubt that theories based on the RKKY interaction predict oscillatory coupling correctly. In real cases, however, the coupling could still be good for many surprises, as is clear from the anecdote above. Another phenomenon which also finally turned out to be related to growth is that of 90° type coupling. This was proposed by A. Hubert and his group as the reason for special magnetic domain structures occurring in samples with wedge-shaped interlayers. Alex Hubert (AH) and his coworker Rudi Schäfer (RS) can also be seen in Figure 2. For the size of the GMR effect, there is a large difference between trilayers and multilayers, as shown in Figure 9 of . This has been known since GMR was announced publically for the first time at the ICMFS in Le Creusot in France, organized by Irena Puchalska (IR) and Horst Hoffmann (HH). I also met Albert Fert there for the first time (as he attended the conference but was not in the original group photo, I added his photo (AF) on the right-hand side of Figure 2). After we had compared our results and came to the conclusion that we had seen the same effect and thus confirmed it to each other, we were ready for a glass of red wine from Burgundy. We were not the only ones who enjoyed that conference. A group of talented musicians among the participants entertained us with piano concertos (Alex Malozemoff-AM and Jaques Miltat-JM), Urich Gradmann (UG) and Mrs. Yafet on the violin and finally Klaus Rohrmann (KR) with a solo on a water hose. The arrival of GMR was adequately celebrated indeed! Figure 6. Bob Camley who together with Jozef Barnas invented the Camley-Barnas model describing GMR in Jülich. When I returned home from the conference in Le Creusot, I was in a very fortunate situation that I had two excellent theoreticians as visiting scientists in Jülich. A picture of Jozef Barnas has already been shown in Figure 4, a passport photo of Bob Camley is shown in Figure 6. I now had both previous collaborators on spinwaves together again in Jülich, but now the new exciting topic was the GMR effect. Before long, they had worked out a theory based on Boltzmann’s diffusion equation for the evaluation of the GMR experiments which became known as the Camley-Barnas model. Figure 7. My team in the time “beyond” the discovery of coupling and GMR. The title of my Nobel lecture includes the term “beyond”. The team with whom I obtained most of the results “beyond” can be seen in Figure 7. We conducted much work on Si interlayers, where we found very strong coupling but disappointingly weak tunnel magnetoresistance. We also started on “current-induced magnetic switching” (CIMS) as invented by John Slonczewski and Luc Berger. John and his wife Ester stayed with me various times in Jülich. My successor as group leader, Daniel Bürgler, can be seen in the middle of Figure 7 (3rd from the left). Figure 8. My hosts in Sendai. From left to right: T. Miyazaki, A. Yoshihara, H. Fujimori, K. Takanashi, Mrs. Yoshihara, Mrs. Abe. 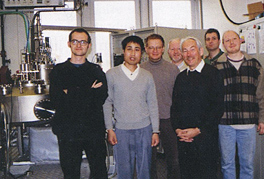 In 1998, I was invited by Hiroyasu Fujimori (HF in Figure 2 and 3rd from left in Figure 8) to come to Sendai, Japan, for 6 months. During this stay, I also spent two months in Tsukuba as a guest of Yoshishige Suzuki. A group photo with my collaborators in Sendai is shown in Figure 8. Of these, Koki Takanashi in 1995 had spent a year in Jülich as a postdoc. Terunobu Miyazaki is one of the inventors of tunnel magnetoresistance (TMR) at room temperature and with Akira Yoshihara I worked on BLS from spinwaves. I officially retired in 2004, but kept a desk and some office space in the research centre within the Institute for Electronic Properties headed by Claus Schneider (CS in Figure 2). In this way, I was able to maintain my contacts with the scientific community, of which I wish to mention only as example a visit to Vladimir Ustinov (VU in Figure 2) in Ekaterinenburg. Now – as a result of being awarded this great Prize, I have also received a new contract from my employer in the form of a “Helmholtz professorship”. As a result, I call myself jokingly a “re-entrant magnetician”. I should explain to the non-expert that re-entrant magnetism is where magnetism disappears as a function of some parameter (like pressure or temperature) at a certain value but comes back at another value. Obviously, the relevant parameter in my case is age! I would like to add a remark on my religious believes. Brought up rather conservative catholique I see religions now more or less in the spirit of Lessing’s (German dramatist 1729-1781) ring parabola which I would top by saying that – not only does nobody know which is the right ring (standing for religion) – but there indeed is no such thing as a right or false ring. Per se they are all equivalent. What really counts is how religions are practised, for example, with tolerance. And yet I believe that there is more than what we see, hear etc., or can detect with instruments. But it is a feeling borne out of many details of my personal experience and therefore impossible to share or communicate. 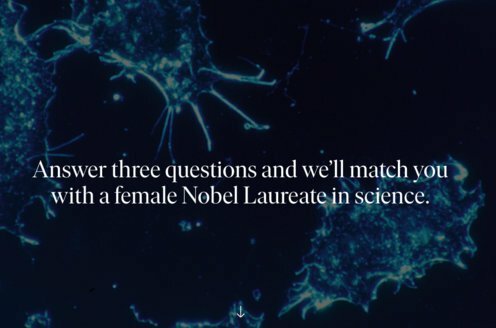 Nobel Lecture of P. Grünberg. Peter Grünberg died on 9 April 2018.